What did you do for Earth Hour? The (yawn) reality | Watts Up With That? 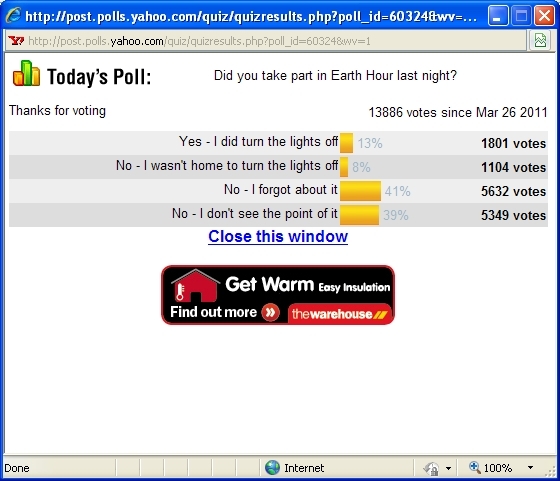 Here’s a collection of thoughts, quotes, and of course the result of our WUWT poll on “what did you do for Earth Hour? First, my own experience: Being keenly aware of it days ahead, even I forgot about it at the appointed time, having been distracted by normal family happenings, so I didn’t remember to turn on all my outdoor lights until 8:50PM. Given other news reports, it seems the novelty has worn off, and many many simply either forgot about it or don’t care. Pointless symbolism isn’t what it used to be I suppose. Is Toronto in the dark when it comes to Earth Hour? Millions of people from 134 countries — from Delhi, India to Heidelberg, Germany — switched off their lights and televisions for the fifth annual Earth Hour on Saturday night to show their support for action on climate change. But Toronto only saw a 5 per cent power drop during the event — half of the reduction achieved during Earth Hour in 2010. The year before that, the city had a 15 per cent drop in megawatts being used. “Honestly we still think it’s successful, we think it’s a great program,” said Jennifer Link, a spokeswoman for Toronto Hydro, who added that cool temperatures likely had many people using more heat than this time last year. In Toronto, energy use fell by 115 megawatts between 8:30 p.m. and 9:30 p.m., a drop of about 5 per cent, said Jennifer Link, a spokeswoman for Toronto Hydro. Last year, the city’s Earth Hour efforts saved 296 megawatts; in 2009, it was 454 megawatts. Meanwhile, Nova Scotia Power reported saving 10 megawatts of power, a significant drop from last year’s 18 megawatts. ‎Locally, the Toledo Zoo participated in the event. Facebook responses included “this is so silly”, “there is no way I can close early to participate” “C’mon, on a freezing cold Saturday night?” and “I enjoyed the hour”. As we drove along Ortigas Avenue, I was freakishly disappointed. Why? Because lights were on and it was Earth Hour. Inside the car, I thought I wanted to blame the relatively-poor marketing the Earth Hour guys had on this year (You haven’t really noticed the Earth Hour 2011 ads as well right? You know they were there but the campaign wasn’t convincing enough). Unfortunately, where I was, it was only us who participated in this event. My parents slept early and I was left with my two grandchildren, age 6 and 7. I had to explain to them what this was all about. Being just kids, they were restless. They kept on asking me how long will this last and why was it our neighbors did not do the same thing. I told them that it will only last for one hour and they should be proud to be a part of this worldwide event, to take a stand against climate change. While we were waiting for the hour to pass, I decided to say the rosary and let them join me. …Kids have this way of asking questions that any mature person would not dare to ask. Five minutes after the hour had passed, we turned on the lights. They kids were happy. The Earth Hour has passed. In retrospect, I questioned myself if I can still go beyond. Earth Hour will come early to Los Angeles International Airport. The ring of 15 100-foot-tall towers near the airport’s entrance will light up a solid green at 7:30 p.m. — an hour before Earth Hour — and remain illuminated for 60 minutes. Then the lights will go out from 8:30 p.m. to 9:30 p.m., an airport news release says. “We did hesitate a bit (about calling for Earth Hour in Japan) because there are many without electricity in disaster-hit areas,” said Naoyuki Yamagishi, climate change programme leader for WWF in Japan. Earth Hour is the largest mass participation event in human history and was organized by WWF—an election between Earth and global warming, organized the largest mass participation event in human history.Created by Leo Burnett Sydney in 2007 and carried on by Leo Burnett Chicago, Earth Hour was the first time people of all nationalities, race, ace, gender and religion were able to vote on the future of our planet as one global democracy. Now, just five years later, more than one billion people turned off their lights in celebration of Earth Hour. Yeah but, how much more CO2 did they release organizing the celebration, getting people there, and putting that guy up in the helicopter/airplane/hotair balloon/whatever to get the shot? To celebrate the worthy cause and encourage participation by residents and businesses in Earth Hour, Dewa, in partnership with Emirates Wildlife Society (EWS) in association with the World Wide Fund for Nature (WWF), Emaar and other government departments and local schools and universities and NGOs and private sectors and residents, marked the event with a traditional Arabic heritage village at Emaar’s Burj Plaza in the Downtown district adjacent to the world’s tallest building, Burj Khalifa. Over 20 Arabian tents filled with arts and crafts, traditional cooking stations, El Arish hospitality, educational exhibitions, music and many local gifts and souvenirs were enjoyed by over 6,000 people who took part in the fun festivities and Earth Hour celebrations. A family occasion, children were also catered to with their own arts and crafts tents, face-painting, delightful entertainment and a conservation exhibition to educate and inspire their young minds. THIS weekend Oxford City Council will turn off all “non-essential” lights in a bid to tackle global warming. But Green campaigners say it begs the question: why are lights burning in the first place if they are not needed? Especially as the authority employs a climate change officer at a cost of £44,000 a year. Two three-minute official Earth Hour videos are below. The 2010 video is all about the global warming hoax. The 2011 video fails to even mention global warming. Make no mistake: this is what winning looks like. Of course, most alarmists are never going to come right out and admit that on The Most Important Issue of All Time, they were wrong and we were right. What they’re going to do is just gradually quit talking about it. This Earth Hour 2011: 8.30pm, Saturday 26 March, celebrate your action for the planet with the people of world, and add more to your Earth Hour. They know the lights will be back on in less than an hour. If they tried Earth Month instead, that would be the end of the global warming religion. It seems wildly popular to turn on lights, or ignore the whole idea, rather than turn them off, doesn’t it? Had a nice CO2 emitting fire going in both woodburners, while watching the big screen with surround sound and having an icy beverage from my huge refrigerator. Life is good. Here in the Netherlands they called it a success when 29000 people turned off their lights.. the other 16 million could not be bothered with it. I watched the Footy, and celebrated my good fortune that I have a long life expectancy and all the other benefits of coal and oil. My fool Greenie Brother (who I love dearly) forgot Earth hour, so he decided to do it Sunday night. I nearly died laughing, I mean, isn’t that like forgetting Christmas to these Religious whackos? I also suggested on Facebook and elsewhere that if you felt you needed to support Earth Hour, you should leave the lights off forever, or drown in your own hypocrisy! What did I do? I verified that someone mentioned http://wattsupwiththat.com/2010/03/27/earth-hour-in-north-korea-a-stunning-success/ on the announcement post, looked as some of the other comments, and didn’t even bother to mention to my wife it was Earth Hour. Ooops! I guess I missed it. It was dark and cold so I turned up the thermostat, turned on a few more lights and watched a movie. I even saw that my earth loving neighbor had on his porch light. So much for saving the planet. I put a load into the dryer at 8:30 and set the timer for sixty minutes, switched on all the lights and opened the curtains. Every little helps. Most of Germany seems to have simply ignored it. Certainly where I live, no one bothered that I could see. Darn, was busy arranging my sock draw, forgot to turn the lights out. I live in the developing world – for work reasons – and we celebrated 17 mandatory earth hours today. Lesson learned? More hype, shorter period. Next year…… Earth Minute. Ha ha, I forgot too. Did anyone drive past Al Gore’s house this year? I had do deal with some of life’s little realities: laundry, bath time, a full dishwasher, an electric oven in need of (self) cleaning, a hockey game on the HDTV, and email in need of answering. Isn’t it interesting that all were engaged at around earth hour. ;-> I certainly wasn’t in the mood to light several dozen CO2/CO emitting fire-hazard candles for show. A quick look around the neighbourhood showed that few of my neighbours were interested in this silliness either. I’ll be completely honest… I forgot about it! Compared to previous Earth Hours here in NZ. I noticed the majority of people in the neighbourhood kept their lights on this time. A few years ago I was one of the very few people who still had the lights on. I went out to eat with the lights on in the house (to keep burglars away) and a load of laundry and the dishwasher running. Oh, and the computer was on. I was going to do something but to conserve energy I didn’t. Here in the university city of Uppsala, Sweden (just north of Stockholm) nobody really cared. Here is the Sunday morning edition of the local newspaper UNT complaining that the Town Theatre (stadsteatern) had its lights on when it had promised to turn them off during Earth Hour. Another “rebel” in the next block had just white xmas balcony lights on. But I later noticed a party inside. Heathen! In other words Earth Hour is a complete fizzer that ordinary people have seen through yet the media make out it’s a huge success. Why are they such liars? Propaganda and it’s followers. What a joke. I do my best all fricking year to conserve and the ring in nose types click off a few lamps for an hour and THINK it is enough. Stupid is as stupid does. I turned on all the light i could, Ran my electric heater, Plugged in my car and turned on every computer i have and watched a movie on the projector in protest. Stupid WWF hot air. Worse than Gore. Next year i am going to get a bigger heater and more 100 Watt light bulbs. Would love to see them do it !! We turned on all the lights, cranked up the A/C and dehumidifiers, baked some goodies in the oven, and celebrated human achievement hour. Nearby St. Petersburg, FL celebrated Earth hour today with the running of the Indycar St. Petersburg Grand Prix car race. Darn, I forgot all about it. I had planned to turn on more lights even though that also would be a silly gesture. That’s probably why I forgot. I had a bit of an battle with my other half. I grew up in a house without electricity and hate being in the gloom. She has Scottish blood and hates waste of any kind. We had lights going on and off all evening. Same as most nights really except more lights involved. I reckon if any of these green wacko’s spent a couple of harsh winters in a remote Scotttish farmhouse without the benefit of electricity and the internal combustion engine then a permanent state of “earth hour” would be their worst nightmare (it’s certainly mine). I didn’t change my normal routine. And from what I could see, neither did most of the houses and units near where I live. Here in British Columbia we have a load of 9 gigawatts, the utility said there was a reduction of 117 mw’s, be still my heart. Now I am a retired power system operator from that utility and I know it is pretty much impossible to separate that little change in load from the noise. I smell politics. Clothes washer running, one sock in the dryer, drying, one dish in the dishwasher, All lights on including the 4 banks of 8ft ones in the garage, Two tv’s, two computers, Nscale train set and all the interior and exterior lights on. Took almost an hour to shut things down after Earth Hour. I actually participated. Although I did turn off every light and appliance in my house (I went one further and just killed the main breaker. Much easier) I did NOT sit in the dark and cold and worry about the earth. Rather, I sat under a blanket on the sofa with my wife. We discussed energy and electricity use, as well as more broadly our own personal resource usage. Our discussion was actually quite interesting. We concluded that we could probably reduce our resource usage slightly with little disturbance to our personal lives. I don’t understand the hatred here for Earth Hour. I am an avid supporter of this website. I am a skeptic. Not only with regards to climate change, but all things. I am skeptical of our political leaders motives, skeptical of the oil companies, skeptical of the green washing, skeptical of modern medicine, skeptical of spiritual healers, and so on. I am even skeptical of the skeptics that post here. I expect their information and thoughts to pass the rigor that we expect the ‘warmists’ to follow. I am skeptical of most things I hear until I have had the opportunity to dig and validate them. There is one thing that puzzles me though. An event which can’t possibly impact anyone but oneself such as Earth Hour is causing such a stir with everyone. I mean, how can turning off my own breaker on my house possibly impact those of you that choose not to? Why is it that everyone is so against this? It seems people here are more up in arms about a voluntary symbolic gesture known as Earth Hour than they are about things that actually impact their lives daily in a negative way. I find all of this especially odd because Mr Watts himself has even said he has done things to reduce his resource usage: His solar panels as one example. Do those of you ridiculing Earth Hour also ridicule Mr Watts pursuit of solar power? How about his putting lights on timers? Insulating his house more? He even has an electric car!!! Do you ridicule those who elect to take transit to work rather than drive their car? Does it bother you that people participate in symbolic gestures for things besides ‘global climate warming change anomalies’? I have some other pointed questions. Does it irritate you when you see a cross on someones rear view mirror? How about the little fish on the back of someone’s car? What about someone wearing a turban? Or perhaps a wedding ring. Those people are simply participating in a symbolic gesture to show that they care in some particular idea or concept. Do you ridicule them and their ideas? These aren’t things that can be right or wrong. They are simply ideas and beliefs that people can have and, as such, aren’t open for ridicule. Unless of course, each of us wants to open up ourselves to ridicule over every little thing. Why don’t we spend our effort and attention on things that matter instead. Of course, much of my post is tongue in cheek, but I hope it gets the point across. There are things we should get up in arms about. There are also things that quite frankly don’t matter. Earth Hour is one of those things that doesn’t matter. It is the equivalent of people who pray before going to bed. We don’t get all cranky about that. Now how about we get back to science and climate rather than poking fun of symbolic gestures that have little to nothing in the way of consequence. hahaha like the way they say people in India were turning off the lights for Earth Hour. Having lived in India and have family there, Indian city blocks suffer blackouts for miles quite often and life becomes very difficult for them when it does. Without air conditioning homes turn into saunas. Without fridge food goes bad and attracts insects very quickly. Mosquitos spread malaria quicker in the dark as they are not confused by light and are guided directly to warm blooded mammals. Etc. Should be given a proper job like street sweeping. Well I did turn my lights off at 8:00 PM and immediately I almost got in an accident! That was the end of Earth Hour for me. The drop in support of Earth Hour has a probable large component of a “donor fatigue”, in which those who are concerned enough to act become tired of doing so. They still believe as fervently but want someone else to do the do. In the case of climate change, the Toronto warmists may think, rightly, that government is responsible to act according to their wishes and only the government can cause significant good. The warmists obeying the Earth Hour summon in ’09 and .10 have raised consciousness (as liberals like to say); that was their job and they has done it. All of that is interesting. What is alarming is that despite the events of Climategate etc. since 2009, that population responsible for the reduction of 5% of total and 15%? of discretionary power consumption are still very large and rabid enough to turn off their junk. There are a lot of CAGW believers out there. There is a lot of momentum to be dealt with before nonsense can be changed into sense. I’m getting very confused. My intention was to ignore earth hour, but I forgot to find out when it was going on so that I could ignore. The big problem is all these different time zones, so in future, please could you give times as GMT, so that I can be sure to ignore it at the right time! Being your basic cheapskate, I conserve electricity when and where I can. I think this sort of stuff is truly stupid. Spent the hour looking for a satellite image of North Korea, but really couldn’t see much of anything once I got it. We turned on all of our lights and celebrated the great human invention – electricity – and thought about all of the people in the world without it. What a selfish, elitist thing to celebrate. Then how about if I try it again, slower…….. Does anyone else think turning off the lights for one hour is totally inappropriate and insensitive when people in Japan are freezing and going hungry because they have no power? wait, what…there was an earth hour? Talk about a death spiral . . . . . . .
Can’t we have a Earth year and see how these people so concerned can experience no electricity during this time. Don’t think they would fare too well especially during Winter, but I would expect a population boom to follows society’s behaviour of the third world. Seriously though, I’m against such pointless agenda driven event and shame that all the public don’t see it’s actual benefits and won’t cause humans serious problems via climate, based on observed scientific evidence. Though will cause humans problems implementing polices trying to cater for a non problem. We had to go out last night to a wine tasting. I too left the lights on (turned more on in fact before leaving). I even switched on the xmas lights before heading out, but here in Calgary where it’s been snowing for the last week that might have just been interpreted as being festive. Oddly enough, at the wine tasting we were interrupted by an annoying sound around 9:00. The fire alarm in the building started clanging. After the fire dept arrived they found a fire from an overturned space heater in a daycare within the strip mall. Thank goodness for electricity which powered the smoke detector, alarm, and phones to contact the fire dept. Here I went and totally forgot about it .. again. As penance I shall turn on a light bulb and stare at it in a moment of silent contemplation wishing for the day when everyone in the whole world can have light, heat, cool, food, decent shelter & sanitation. There I feel much better now. Of course you are going to need a lot of energy and efficiency to achieve that but maybe now we can start the third world thorium reactor drive. LiFTRs to the rescue. But if all those 3rd world countries become energy independent then how will we ever control and exploit them? I was out helping reload/fix a hosed computer and forgot about it. Hopefully we at least used a bit of power rebooting a bunch of times thanks to Bill. Hawaii failed to even acknowledge the silly non-event this year after Mayor Hanneman urged Honolulu citizens to observe it last year and absolutely no one did, including Hanneman himself. The WWF should have said, “We’re canceling Earth Hour this year because we’re too busy focusing on relief for Japan”. Well, I feel guilty. I completely spaced it off this year. In years past I turned on every light in the house. My girlfriend complains that when all the lights I’ve put up in the garage are on it looks like daylight (she’s right) yet she still wants more light in the kitchen beyond the 650 watts of halogen already installed. Next year I promise I’ll do more to emit more CO2 and consume more electrons. I turned on my outside lights, but otherwise ignored earth hour completely. “I did what I said I would do…….nothing. But I also forgot about it, too. Fortunately, if you plan to do nothing and then forget, you’re still covered:<)"
I followed your plan to a T, Bob Barker. 🙂 My results were the same. Ian, in answer to your pointed questions, my comment above is instructive. Earth Hour is so meaningless that I forgot all about it. But I think the ongoing bad reaction to it is evidence of the obnoxiousness of AGW proponents in general and of the initial Earth Hour campaign in particular. The first year (or at least the first year it went international) it was a full court press of moral indignation. It went from being a fun idea to an obligation that proved your moral worth as a human being. But it’s so stupid, it’s hard to take the campaigners’ seriousness seriously and their “we’ve got the moral high ground attitude” is off-putting. Especially, as many believe, if it’s much ado about nothing. And don’t get me started on the whole “let’s light a bunch of candles” thing. Candles are dangerous, polluting, inefficient (how much light do you get for each unit of carbon dioxide produced? ), need to be transported (which uses energy), and just epically symbolic of the ridiculousness of this whole thing. What is the point of acting completely differently for one hour in a way that has nothing to do with any possible future energy scenario, except one which might follow a complete collapse of our technological society? People here are reacting to the triumph of irrationality – and it’s no surprise if they get a little testy about it. People accuse AGW skeptics of being anti-science, when what they are in reality is anti-fantasists. They don’t buy the malarkey, or even the symbolic malarkey, that the Greens are trying to force on us. And, as we’ve learned in the past in other areas, if you give them an inch you are in danger of giving them a mile, and so we are standing firm. We poke fun at it because it is in aid of saving the planet from CAGW. It’s a total joke. Jennifer Link, a spokeswoman for Toronto Hydro, who added that cool temperatures likely had many people using more heat than this time last year. They are too cold to save the planet from warming! It was dark, so I turned on all the lights, it was a bit chilly, so I turned on the electric heaters, I had laundry to do so I had to put on the laundry drier to make room in my washing machine. Then I went to my room and played on my electric guitar with the amp up quite loud. Times like Earth Hour really brings home (no pun intended, really!) what a wonderful thing electricity is. I hope one day all the world gets to experience it. Few ridicule the cross dangling from the rear view mirror and other religious observances, or efforts to reduce use of energy and resources. You missed the point of the opposition to the hypocrisy of Earth Hour. How can I explain it to you. Hmm… if you were a budhist, would you be against someone else hanging a cross on your rear view? Today, Sunday 27th March, I telephoned my 89 year old Mother who still lives in Luanshya in Zambia. She’d just got back from a trip down to the Kafue River, where our somewhat extended family has what we term a ‘shack’: it is, in fact, a brick-built bungalow. Apart from going fishing for Kafue Yellow-Belly bream, she’d taken paraffin and candles to our caretaker and his family. There’s no hope of ever getting any electricity supply to their location in my life-time. They didn’t blow out any candles or lamps for this fatuous idea of Earth Hour, they ate their evening meal in the gloaming of the evening, not in the darkness of the night. Their day ends at 2000 hours as they cannot afford to burn their lighting fuel beyond that time. After 2000 hours, they rely on what meagre light they get from their fire, for which wood has to be collected every day. And yet our caretaker counts himself to be one of the fortunate Zambians; he has a job which pays, his children (and those of his now-deceased brother and sister-in-law, both victims of AIDS) are both fed and educated and he is grateful that his wife now knows how to regulate and moderate the arrival of more children, courtesy of my Mother having had a ‘girlie-talk’ with her and introducing and supplying her with The Pill. He has four children of his own and now has his late brother’s three children as well. Now he does not want any more children as he does not need them. His present family is guarded against malaria by both prophylactic drugs and DDT-impregnated mosquito-nets (supplied from China and re-sprayed with Chinese aerosols every month) under which he and his family sleep. Willis Eschenbach was correct in stating that improving the life of a man and his family reduces the size of that family; I know, I have seen it work and every month I still make my own financial contribution to make sure that this state of affairs continues. I’m paying towards the up-keep of a family I haven’t seen in ten years and I’m glad that I can do so. I celebrated Earth Hour by adding up how much I’d paid over ten or more years towards making life a trifle easier for one man’s family but regretting that I was not able to do more. I just wish that the Greenies would do the same for many more such families. It would make much more of an impact than just switching of some lights for a moment or two. Gee, earth hour’s been going on for 5 years? This is the first I’ve heard of it. And I’ve never seen one single advertisement, or any hint of earth hour except on this blog. However, I don’t watch T.V., so maybe that’s it. Also, if you wanted to have a more effective earth hour you should make it at 3:00 am. I know I’d participate. PR people always bring a smile on my face. They are such lovely, cuddly creatures. Yes, it’s only symbolic, and no, I don’t get upset at seeing people with crosses on their rear-view mirrors. But then I also don’t have those same people condemning me and everyone else for NOT sharing in their meaningless symbolism. There are many symbolic events people take part in during the year — but the language of condemnation that comes from those who partake of Earth HOur against those who don’t is nasty and downright scary. No. I don’t like it. And it isn’t harmless. I tried to add to my moth collection by burning several 400 watt metal halide bulbs outside. After an hour of catching nothing, I realized that moths must not like -8 degree C weather. Maybe next year? But organisations like WWF do have an effect and ‘Earth Hour’ is important to them so it cannot be ignored. Further, consider that WWF-UK ‘s latest annual review for 2010 shows they had an income of £56.71m against an expenditure of £50.51m. Thus this ‘charitable’ organisation made a profit of £6.2m in the UK alone. Now is this what all those good people who contribute expect of such an organisation? We are against this because we are sick and tired of the green agenda; one that noticeably impacts our life and is based on bad science (myself I wouldn’t even call it science, as very little of what is accepted as truth is sufficiently proven for scientific standards). You ask would I get mad at seeing the Jesus Fish or a wedding ring- of coarse not. Those beliefs (both of which I don’t share) don’t hurt anyone. Would I get mad at seeing a burning cross and a bunch of men in white hoods talking about supremacy- YES. Even if they don’t hurt anyone directly they are encouraging others to do so, and embolden them to take action. This is especially important to climate change because it is unlikely that most enthusiasts will admit to being wrong. We can only hope they stop being so enthused. Was I the only one who saw the irony in that quote? Earth Hour. Whoops! Thanks for the reminder. Didn’t turn on all my lights. Then again, I didn’t turn anything off either … while I hopped in the car and ran out to the store and got back home after the whole silly thing was over. I suppose the limo libs were gushing over each other about how wonderful they were in caring for the planet. The longing for power of the greens does affect me. Earth Hour is one of their yearly propaganda events. So it is the obvious target for derision. It would be ironic if the yearly Switching Off Of The Lights in a city like, say, Shanghai would produce some extra tourist travel… From the marketing video for Earth Hour, it looks like a huge party. Ian, I understand what you’re saying, but let me ask you this. Did you really turn off your breaker during Earth Hour to save energy — or was it to save face with your neighbors so they wouldn’t tut-tut you the next day? Did you feel any pressure from your neighbors to do as they do or suffer the scorn? If not, that’s wonderful. But in some neighborhoods things are different. As for being offended if someone has, for example, a religious symbol on their car, I’m not. But I AM offended if someone tells me I should have one, too. Especially if they imply that I must not care about God if I don’t have a religious symbol on my car. That’s the way I see Earth Hour. I happen to conserve energy as a life-long habit. I just don’t feel the need to prove my personal conservation efforts to anyone. You took Earth Hour as an opportunity to reflect on your own energy use and that’s great. You put the exercise to good use. (In my house we happen to have that discussion pretty much every time the electric bill arrives, as things are a bit tight.) But the way it often goes with people, Earth Hour is just as likely to be a time when people feel pressured to “fit in” with the rest of the neighborhood and cut the lights for one hour, and then they’re done conserving until next year. It’s the potential to be a meaningless gesture that elicits the mockery, in my opinion. Ian, I can’t speak for everone, so I won’t, but in my own case, as someone who’s lived in a communist country and has been subjected to pointless, organized and purely symbolic mass gestures such as this one, I find the dissent, non-cooperation and ridicule expressed by folks here actually quite heartening. I watched it snow in Kansas–and kept the heat on and put a fire in the woodstove. Also lights stayed on. I am not a fan of cold and dark. I know, I know, weather is weather, but I still find it amusing. Bugger ‘earth hour’ let’s have ‘earth week’ turn off all power except renewables for a whole week. If that doesn’t cure the idiots nothing will! It would be worth the sacrifice just to hear crying and moaning. I always knew the smartest people in Canada live in Alberta! I should have never left that fine Province. Going the “one step further” of turning off the main breaker would have been catastrophic had there been an undetected fire in your house last night. The “pointless symbolism” of Earth Hour would have turned into a Darwin moment. I can’t speak to why so many on this blog protest against Earth Hour, but I can speak for myself. I find it damn annoying when someone suggests that you do something that you don’t really believe in, or that you adamantly believe is untrue. Do I think any less of AW that he has solar panels – no. Would I think less of him if he suggested that I get solar panels – YES. Does it bother me that people wear crosses or turbans – no. Would it bother me if someone suggested that I should wear them – damn right. sounds just about what the greeners want for all of us.. I turned on all my lights and baked bread at 400 degrees F in my electric oven. Plus I sent all of my colleagues a lengthy message incuding charts showing the statistical correlation between electricity consumption and GDP, and the inverse correlation between electricity consumption and childhood mortality. Then I calculated that in order to generate enough electricity for me to keep 11 x 60-watt incandescents alight for 1 hour, Ontario Power Generation generates the same amount of CO2 as a tea light burning for 34 minutes. In other words, if I follow the arguments of the carbon gestapo correctly, I can either have 11 powerful electric lights burning for an hour, or one tiny tea light burning for 34 minutes, followed by 26 minutes worshipping Gaia in the dark. In reality, though, I could have 88 light bulbs burning for the same amount of carbon dioxide, because I use 7.5 Watt LED bulbs. Kept every light, appliance, and electrical device normally on, on. Couldn’t care less about who participates or not though. Cut costs as much as possible to save OUR money ALL the time. But do make a choices NOT to support a lie that I’m forced to pay false charges through fees & taxes already. Hyped up hydro bill motivated us to turn to wood to heat instead of paying 60% more of what we actually use to this lie. Think I want to use my hot water (hydro) to clean out gooey/sticky cans and jars for recycling them? If it rinses out easy, fine otherwise-garbage. Desirable cardboard and paper are recycled right at our home, in the woodstove to give us the heat benefit. I should be careful…next these warmistas will ban fireplace/woodstove homes from having certain cardboard and paper in the dwelling. More money for the utilities and the the higher ups for their ‘one world order’ via carbon tax plan by the current corrupted UN gang. Nothing would surprise me anymore in this “corruption rules” world. I already spilled the beans in the other thread, but I made a few changes when the time came. I did go out and fire up the shop lights. They are mercury vapour lights that take around 15 minutes to glow up to full brilliance, so I had to start them ahead of time. I usually only use 2 or 3 as it is enough most times, but I threw the switch on all 9 of them. The light coming out through the skylights was awe inspiring! It was suddenly twilight again for 500 metres in all directions! I then revved up my diesel powered arc welder and did some jobs that had been set aside for a rain day. As the coup de grace I set my spin grinding machine on auto with a badly worn cutting unit in it for the whole hour. All in all I think I used a staggering amount of electricity. Only one house — my next door neighbour — dimmed their lights again this year. All was not lost for the AGW cause though, as they lit several dozen candles and likely ended up contributing far more CO2 than they would have otherwise. I fell asleep happy and dreamed happy dreams of racing down Chilliwack Lake in my speedboat. Throttled to the full 2 1/2 gallons per hour, and all lights blazing! I did not participate in earth hour. I took advantage of the efficiencies offered by my dish washer, washing machine and dryer to save the local river bank from the pollution that would otherwise result from more traditional methods. I also look at it as contibuting to a more efficient use of the coal fired power station that would otherwise just be in spinning reserve mode for an hour. I do however try to maintain basic economic practices instilled since childhood about not wasting electricity or water. Rather, I sat under a blanket on the sofa with my wife. We discussed energy and electricity use, as well as more broadly our own personal resource usage. So it’s dark, you’re huddling under a blanket with the woman of your dreams, and you spend the hour talking about domestic energy and resource policy? If alarmism is genetic, we may still have a future. Alternative activities may of course have generated more heat, CO2 and fun, but hey, it’d be natural. Everything was on here for good reason…there is no need whatsoever to conserve electricity. If we need more we can make more, simple as that. To try and convince us otherwise is fraudulent and regressive. I spent Earth Hour watching the final Shrek movie (didn’t really like it). I am a rebel and I think that reducing your energy usage is a lot more important than one symbolic hour. Even if it did make a difference, I would not celebrate “Earth Hour”. Why? Because it is the brainchild of the far-left environmentalists who think humans are a scourge of the earth. I do not want to give such people any victory. I too forgot all about it until an hour after it was supposed to be over. So only half the house lights were on as we were downstairs enjoying another late winter evening in the Pacific NW. What the heck is “Earth hour” anyway? Any Malthusian should not be allowed to preach the gospel of Malthus whilst still alive. They should be forced to pre-record their anti-human misanthropic rants on video, then they have to kill themselves, then and only then are their preachings allowed to be played – anything else is pure hypocrisy and cannot be tolerated. You can’t call for population reduction unless you reduce that population by taking your own life first. Common Sense really. I was not aware I have dyslexia and I don’t usually swear but each time I see WWF my brain sees WTF. I care for all creatures and I love plants and I don’t like waste. I really am green at heart but I will not be lectured by elitists who for the most part would not know nature if it bit them on the bum. I threw another shrimp on the Bar-B, metaphorically speaking. I read WUWT! And I agree with much of what Ian said above even though I think CAGW is a miscarriage of science. Gin, red meat, & gratuitously recompiling my operating system. 03/26 20:30, 38696, 36249, 0.937 Sat. Earth Hour Begins last half this hr. 03/26 21:30, 38696, 34784, 0.899 Sat. Earth Hour Ends first half this hr. If you can see the effect of Earth Hour in the data, the “Team” has a place for you. I drove around without my car’s headlights on for an hour. We lost power @ 4:50 PM and just fired up the generator powering the entire house. When PG&E restored the power again around 8:00 PM we kept the lights on from then til bedtime. Odd that the power went out as it did but we celebrated none the less thanks to the generator backup. I live in Amsterdam. But neither I nor the people at the pub were aware that we had to turn off the lights for one hour last Saturday night. I was going to answer the poll, but it was such a non-interesting thing, I forgot. Sorry to report that I couldn’t participate in the anti-Earth Hour festivities. I was camping with my sons, so I really had no lights to turn on. However, the Earth Hour alarm that I had set on my cell (complete with rechargeable battery) did go off. So, had I been home, my lights would have been turned on. Also, what camping trip wouldn’t be complete without a carbon-burning campfire? We had two at our campsite all day Saturday, and a massive camp-wide one Saturday night. 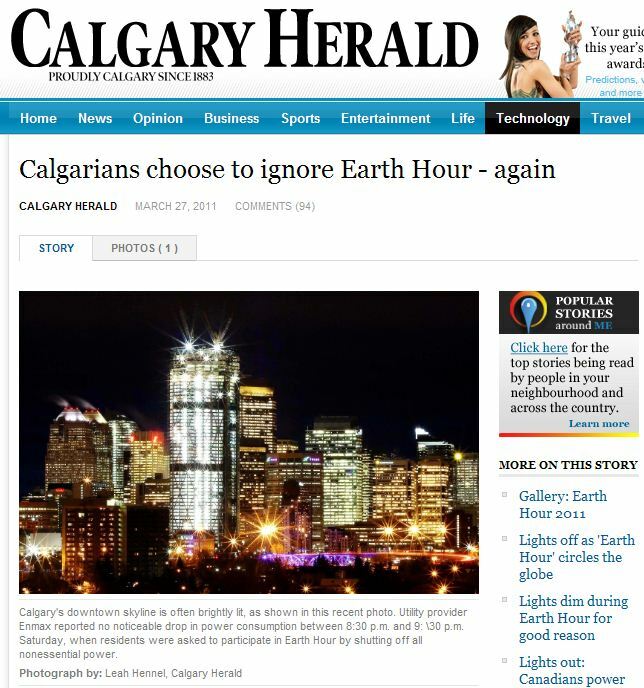 No wonder the Canadians ignored Earth Hour when the head honcho ignored it as well. Oh shoot ! I forgot about it. I was going cook a tri-tip roast in the electric rotisserie, turn on the 100W incandescent front porch light, turn on both TV’s, and iron my dress shirts. But instead, all I did was fall asleep with the`TV on. Try it again next year! I enjoyed the Earth with my lights on with my hour. I also enjoyed not caring about what a bunch children and zealots think. Freedom. Embrace it. Enjoy it. Hysteria. Reject it. Ignore it. Recently I installed three solar tube round skylights in my kitchen. [They’re great, BTW – I never need any lights in the daytime]. Each 14″ tube has two 30 watt fluorescents [125 watt equivalent each] mounted in the tubes, with a plastic dome on the roof to catch the sunlight. When the fluorescents are on, the domes stand out extremely brightly. It’s almost embarassing. Everyone around can see them shining brightly on the roof. They know we’re home, for sure. So I kept them on for the EH, plus my front and side yard lights [I live on a corner]. We went about as we always do, being grateful for being born here and now with all the advantages we have. I too conserve as a matter of course, and have my entire adult life. But I don’t appreciate being told I have to by a green hypocrite. Stephen Brown, Bless you for caring for your extended family! I’ve a friend who does the same, saying that a relatively small sum of money to us goes a long way in Africa. I live about 5 miles from a PG&E hydro electrical facility, and per the folks who checked out the stability of my old power pole last year (after they put a new transformer on it after a nasty storm knocked the old one out) my electrical power comes from the Camino substation that is connected to the hydro facility. Since my electrical energy at night comes from a carbon neutral source (we generate about 60% of our yearly electrical needs from a small PV system) I thought I’d contemplate a few items that have been on my mind while watching favorite doomsday film- “The Day After Tomorrow” for Earth Hour. 1) Now that PG&E no longer collects “accurate” rainfall data at the weather station for my area does that mean that the 150 year record of temperatures for Placerville will no longer be made/accurate/traceable to a like geographical location? Editor’s note — The Mountain Democrat based its Rainfall Contest on statistics supplied by the local office of Pacific Gas & Electric Co. PG&E no longer will assist us in compiling accurate rainfall statistics. We’ll review the matter for next year if we can find a reliable statistician. 2) Should I burn, chip and mulch, take to the dump or ? this years downed trees- two big oaks, lots of oak limbs. What would be the most carbon neutral way to deal with this material. The California Air Resources Board (CARB) could provide no input to the question a year ago- they indicated that they are going to study the issue and publish a paper……………..
3) If an electrical utility is operating a set of generating plants to provide X Million Kwh of energy to their customers at time points 1, 2, 3 and at time point 4 their demand drops by 10%, for say 55 to 60 minutes, what actions do they take to manage the load and will any less carbon dioxide be released from the generating plants with a temporary load reduction? 4) Why does the concept of capacity factor bother me so much when it comes to wind and solar generation ratings vs when compared to say a hydro, coal or natural gas fired generation facility? I have actually read all the posts since my initial post earlier today. I appreciate that everyone kept it civil and responded to my concerns. I now understand better why many of you despise Earth Hour so much. It doesn’t mean I agree with it, and it won’t change my stance from being a skeptic to less or more of one. To the person asking if we turned out lights off because of the neighbours, the answer is ‘no’. I took a quick peak down the block and all the lights were on at pretty much every hour. but it started from a 2673 MW higher load than the previous week. It’s not the Earth Hour, its just the weather. I turn a light off in a room if Im not using it anyway, so the Earth Hour idea is moot. That being said, I celebrated it by playing a video game. To be fair, I did have the lights dimmed a bit, to maximize the colour on my television. We did this one year, at the behest of a roommate. He turned off all the lights and lit oil lamps. We were sneezing black soot for a week. I didn’t even know there was an Earth Hour 2011. Woops. And to think of all the carbon emissions I could have saved by turning off all of my lights and lighting a few candles manufactured and shipped from China… Dagnabit! Out with friends Saturday night as usual. We always turn off the lights when we’re out – saves on the utility bill, you know. Hope the neighbors didn’t think it had anything to do with earth hour. I doubt it, though, because no one I know around here has ever mentioned it and I never saw anything about it on TV or local newspaper. The lead is scientifically illiterate; you can’t “save” megawatts. That’s an instantaneous power level. Energy used is in megawatt-hours. We had every light on in the house, the dryer running, the washer running (with it being non-peak rates on Saturday, this was the time to do it), one son on a computer, and one son watching the Maple Leafs reach the inevitable conclusion of their season, and the Christmas lights all blazing. Since I reflexively turn off lights when nobody is in the room, I had to keep restraining myself, but kept myself distracted with WUWT in front of the electric fire on full blast. It was like revisiting the 60s, when lights were on all the time. Tonight we’ re back in the normal semi-gloom to keep the skyrocketing energy bills (thanks to the province’s Liberal government’s infatuation with ‘green’ energy) under what little control we have. I like the idea of calling this endeavour Human Achievement Hour. The McKitrick essay is on my door at the university. Just rechecked the lutw.org site. They now have home individual setups available, complete. Check the site’s ‘Products’ tab, and you can email them: c.shultz@lutw.org for details and pricing (which I don’t know). Or 403-206-5004 if you want to discuss the specific situation and get advice. Oops, typo: 403-266-5004 . That’s the Mountain Time Zone, EDT -2hrs. Truthfully, I don’t see this as a sceptic issue, but more of a groupthink issue. I don’t like sports. I don’t understand why anyone would give five minutes of their day to bother finding out the score in a child’s game played by two teams of players they’ve never met, much less actually spend hours watching said games. I find the mentality of such behaviour questionable, at best, and quite possibly indicative of a deep-seated neurosis at worst. Not many men share my view, but some do. Of these, there is a subset whose condemnation of sports, and whose occasional attempts to have them banned or curtailed, ignite in me a strong desire to go out and watch a football game, even if I don’t know what’s happening on the field. That’s because while I have no regard at all for sports, I have less regard for anyone who tries to curtail the activities of others, or who tries to force others to conform to a particular way of thought. I don’t know how old you are, but you may remember Leo Buscaglia from the ’80s. He was the “Love Guru” whose message was to go out and hug people. Naturally, not everyone wanted to be hugged. What did he tell his followers to do when that happened? He told them to say to themselves, “Well, that’s too bad for them. Now they’ll never know what a nice person I am.” In other words, in their quest to spread love, his followers were to condemn anyone who didn’t bow to the party line. Same here. If people wanted to shut off their lights for some symbolic act, I wouldn’t consider it any more, or less, significant than people who light Christmas trees in December, hang a Mezzuzot on the door frame, or wear special underwear. But when these people start condemning everyone else who doesn’t follow their custom — then it becomes a matter of significance to me. As a matter of routine, I hereby confess that I am an old retired bureaucrat in a field only remotely related to climate, with minimal qualifications and only half a mind. Re Ian, Mar 27 2011, 1.51pm. Congratulations for coming up with provocative questions! All religious car stickers and notices of that sort, and gestures like Earth Hour, in whatever circumstances, are intended to make a point. If I believe the point is nonsense, am I not entitled to seek to advertise my distaste in much the same way that the stickers and gestures do? Moreover, and evidently in common with many contributors, if I believe the point is contrary to the public interest, am I not under some sort of duty to protest? So this is the answer to Ian’s primary question. Earth Hour is seen to be a (Ya-boo confrontation style) gesture in favour of a nonsense, and many have felt bound to protest. And maybe the more strategic will have being playing the numbers game: attempting to establish that more people objected than agreed. For myself, I forgot about the whole thing, which was remiss of me. I should have turned all the lights on and fought off the protestations of the Missus who, quite rightly, would object to the useless waste of money. It was just a normal Saturday night for me this EH, like almost every other Saturday night. …I turned off the same damn lights that I always do (the ones that my wife seems to leave on in empty rooms). I’ve turned into my Dad…. Dang, to be honest, I have never heard of Earth Hour. I read hours a day on the internet and watch plenty of cable news. And notta clue that there was such a thing. Then I had to go to WUWT and find there is something this foolish going on. Dang you, you climate skeptic you, for promoting this. You shall not be forgiven. At least until this post passes onto page two of the blog anyway. I switched on my central air conditioning for the first time time this year in SW Florida. New Zealanders are thinking less of earth hour. I understand that the response was down 30% from last year as well. Not surprising as more people are seeing through the AGW baloney. I agree with what you say, which i think to each his own. Why some are more vigilant against this event, using a religious analogy… It would be kind of like a bunch of folks coming out and saying, we would like everyone in this country to go in the streets on a Saturday night for one hour and celebrate the benefits of Sharia law. Trust me, there would be plenty of folks on the streets. Earth hour is kind of anti-civilization as Ross M has so eloquently pointed out before. POWER CONSUMPTION IN EDMONTON WENT UP DURING EARTH HOUR. Typo: I’m so ashamed! “embarrassment”, of course. Brian, We’ve considered a number of ways of introducing electrical power to our place by the Kafue River. Each and every scheme which we have contemplated runs into the same utterly intractable problem, one which is ubiquitous in central Africa. Anything which we installed would be stolen within a day or two, and stolen at the point of an AK-47, thus endangering the lives of those we are trying to help. Zambians are poverty-stricken. Once you leave the towns and tarred roads behind and go to where the vast majority of Zambians live and see just how they live, you begin to understand why the looting of anything of value is rampant. This situation is common throughout most of sub-Saharan Africa and is the principal reason why helping those who live there is so difficult. Why do we still need both earth hour and 10:10? Surely they’ve both been so outstandingly successful that the climate disruption bogeyperson has already been scared away. That’s why nobody bothered this time around. Your video clip shows these bozoes burning thousands of candles . Don’t those produce CO2? I had all my lights ON. During a lull in the dinner party talk I asked whether folks were aware it was Earth hour this evening. They all looked blank and sheepish, even these noted for their environmental credentials. There were lit candles on the table and local coppiced hardwood crackled in the wood burning stove. The conversation returned to its original subject and Earth hour was forgotten. I celebrated Human Achievement Hour as the availability of widespread (once cheap) electricity is a major human achievement. As I’ve done during previous Human Achievement Hours, I’ve turned on all of the house lights and simultaneously tested high load appliances. This event is also a good test for the whole house electrical system. My preference is to have the house brightly lit up at most times as it does make the short winter days much easier to take in this part of the country. No-one mentioned “earth hour” to me in the days leading up to the “event” and the pattern of house lighting in my neighborhood in Kamloops BC seemed no different than it is on any other night. We’ll know we’re winning when the power usage demonstrates a clear square wave increase during Human Achievement Hour. As another commenter mentioned, it is hard to get out of the habit of turning off lights when one walks out of a room. Couldn’t do much on the outside of the house as I’ve installed lots of 1 W LED lights which are on 24 hours/day and provide a surprising amount of light at night. They’re also a lot more friendly to ones night vision if you use red LED’s. While the “earth hour” concept may seem to be a meaningless idiotic gesture, there is evidence from psychological studies that getting people to do something minor in support of a cause makes them far more likely to agree to do something far more involved in the future. Thus, events such as “earth hour” are a means of preparing people for the end to continuous electricity as is happening in Britain. I suspect that if you asked a group of people who never participated in “earth hour” to participate in “earth week” (where one turns off electricity for a week), there would be far fewer takers than if one made the same proposal to individuals who had participated in “earth hour”. Two can play at this game of psychological warfare and we should all be promoting Human Achievement Hour. Am I the only one who noticed the irony / idiocy / hypocrissy in the Phillipines quote? To Parapharase: As we drove around spewing CO2 and an assortment of actual pollutants into the atmosphere we were disappointed nobody turned off their lights to save the world. I went walking in the city, looking at the lights and crowds, eating a little food, enjoying the company. Brisbane Australia ignored the great event. Then we went back to the Hotel and turned every light on. I have lived in PNG and Indonesia. I have seen how the real poor live. Even getting wood the a fire can be a problem. And the Green/Labor coalition lost Government in the NSW state election, with carbon taxes a BIG issue. Life is good. Excellent point, doctor. Especially your linking Earth Hour to a specific, very probable plan by governments and power providers to disrupt and reduce services, while increasing revenues and taxes. I would pedantically quibble, though, in that these are still fundamentally meaningless and idiotic gestures, whose intent is not only to achieve a limited aim, like the power disruption in the UK you very astutely point to, but to also break down our resistance to all sorts of new meaningless and idiotic gestures strategically appended to serious and costly policy changes which would be coming down the pipeline at us. That such campaigns are initiated by seemingly independent and popular NGOs, like the WWF, and are often directed at children through compliant and even enthusiastic school boards, may hint at long-term planning. In such a scenario, your “resistance strategy” of marking a “Human Achievement Hour” is quite brilliant. As things are now, those of us who ignore EH (Earth Hour) are accused of being careless and selfish, and those of us who respond by blazing all the lights, in a show of dissent and contempt, are accused of being petty contrarians, antisocial hoodlums and Gaia-haters. In forming our opposition as Human Achievement Hour (with the lovely acronym, “HAH”! ), we provide a solid rationale to what may seem as needless conspicuous consumption on our part, and we would now have an opportunity to properly present counter-arguments, facts and alternate positions, and to openly challenge existing or planned energy policies, especially the increasing complexity of intrusive regulations and rising cost of energy. The beauty of it is that all non-compliance with EH will be interpreted as celebration of “HAH!” (I l-l-l-l-love it!). And, my brain is already on a subroutine, toying with a few ideas about a logo and other visual presentations! I set the timer on the stove so I wouldn’t forget, and at precisely 8:30 turned on our porch lights, shutting them off precisely at 9:30, using .08 kwh and costing some $.014. Meanwhile, I had already made sure to shut off any lights I wasn’t using (I am not always as conscientious) inside. The net result, hopefully, was that I didn’t actually spend even a penny on EH, and may have even saved one or two. It was my one small effort to fight the CAGW machine which threatens worlwide economies, health and lives particularly in poorer countries, and which is an affront to science, to truth, and to basic principles of Democracy. Earth Hour… yes, a moment to remind myself of the comforts of home. Stoked the wood stove, spent some time on the computer, caught the last half of a nature show on our wide screen tv. Oh yes, the lights… some on, some off, same as always! Ian, whilst I don’t agree with some of your ideas about the pointless and patronising Earth Hour, your superb comment about you and your wife’s nocturnal activities made me laugh out loud! This just about sums up the ethos here at WUWT: ideas and theories are discussed with open-ness, frankness, politeness, and (perhaps most importantly) good humour. Compare this with the censorious, aggressive and humourless attitude at ol’ Joe Romm’s site and you realise why the skeptical camp is the more rational place to be. Hm… thinking of it, I’m in something that looks like half an earth hour all the time. The maximum power here is 30 Ah, and I can’t switch on more than three “green” “economical” wall heaters. If I ever want more, I’ll have to buy an entire transforming station with my own money, then graciously offer it with a curtsey to the state monopoly power company so that they can bill me. Yes, this is somewhere in backwater Europe. Interesting indeed. What I did for Earth’s Hour? I pinched it! How much did my protest cost me? I lit up every light in my house. Total 31 bulbs@ 100W/bulb OR 3.1KW. They were on for 1hour. Cost to generate @ $0.038/Kw/hr= 12 cents, 12 onehundredths of a dollar. Cost including delivery, regulatory charge, debt retirement and HST – Ontario Clean Energy Benefit(a reduction) @ $0.152/Kw/hr= 47cents !!!! YUP 47 cents for an immigrant Scotsman to piss-off all the Birkenstock wearin’ hairy armpit, tree huggin’ unemployed, tie-dyed Gaiagaga worshipping eco-freak hippies. There is a God and sometimes he smiles my way! Right in the middle of Earth hour I was flying to Calgary. Just about to go into Calgary airport and the runway lights went out. We were diverted to Edmonton. It made me happy for 2 reasons. (1) It exemplified how important electricity is. (2) We got to spew out even more carbon taking flying to/from Edmonton. Too bad we were in a little jet instead of a big old 747. 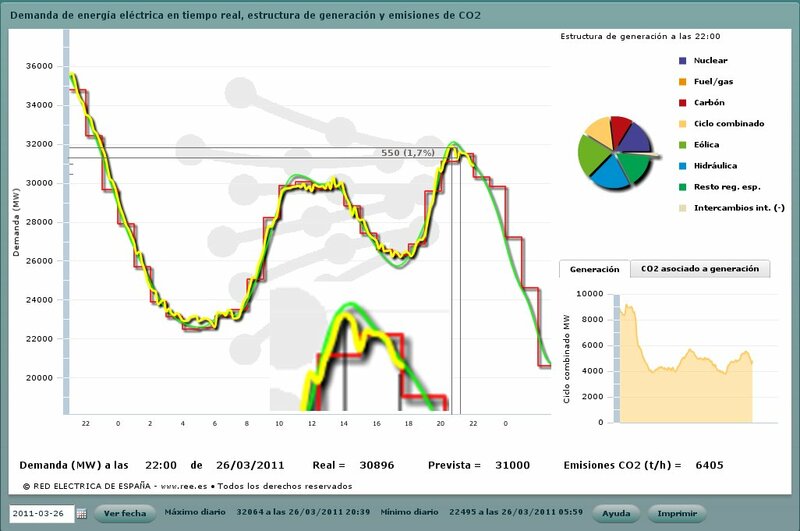 This nauseating AGW scam is now so dead that here in my Latin American country even the mainstream media forgot to mention “Earth Hour” and then I forgot to turn on all lights and machines. Burned a few old tires to light up the yard. I didn’t buy a car, I didn’t run my computer and I didn’t eat fruit delivered by airplane, same as I do every hour. As far as I can tell, that puts my “carbon credit” ahead of 90% of the greenies on Earth. I may have had Spanish wine with dinner, but I blame the missus. Does this not sum up the mentality of these people completely? They get to feel all holier than thou and self righteous with such a completely pointless gesture. If they were serious they should go and live with the Amish community, not for an hour but for the rest of their lives. this would involve working like slaves from dawn to dusk with no modern medicine if they should fall ill. That is the reality of the lifestyle that they seem to be proposing. I grew up in an old farm cottage and during winter the default setting was bloody cold. It had two large fire places and could be made reasonably cosy by lighting two huge coal fires and strategically distributing oil heaters. Now it has central heating, double glazing, better insulation and obviously uses considerably less energy to heat. Not quite sure what my point is apart from the fact that such improvements seem to be ignored by the green zealots. Nobody told us about Earth Hour this year, there was no usual media coverage, it didn’t filter down by word of mouth. After the second major Earthquake (don’t you just love Mother Earth?) many of us had no electricity for days or weeks. The electricity company fast tracked a new overhead line across private land with all planning permission granted almost on the spot. You should have seen the frantic activity going on to try and connect the city with daily reports about the progress, percentages of connectivity, spokesmen trying to assure the public that they were doing all they could as fast as possible. I guess if you’d gone down to the unconnected suburbs and talked about Earth Hour you might have gotten a smack in the mouth. How many CO2 is produced by burning that many candles starting at 0:12 in the video? David Menzies was interviewed on a local radio station here in Toronto about his Celebrate Human Achievement Hour. He stood outside at his barbeque and enjoyed many accolades from enlightened passers-by. However, he also reported seeing during the hour around 40 vehicles driving by his place with only the riding lights on. He eventually stopped one to ask the driver why his headlights were off. Response: to take part in the spirit of Earth Hour since the driver was not at home to turn off his electrical lights and appliances! For Earth Hour I celebrated by doing my usual Saturday night ordeal. Hours of reviewing Quantum Mechanics Lectures. (The pain will end soon – semester ends in 6 weeks – then I get my life back for the summer). This is complete with two computers running and every light I can find on so I don’t miss an i squared on a paper. It was a bit chilly too so I had some bread baking in the oven to warm the place up a bit. What exactly do they mean by “earth hour saved xyz MegaWatts ?” I would think if oyu were trying to save energy, you would save MegaWatt hours and noit MegaWatts. Oh I forgot; in the warmistas world, you can use any units you like; it really doesn’t matter whether you use the correct units or not. Under the guise of community, the utilities is in fact fostering a mentality of delation, dressing people, neighborhoods, towns against each others in order to achieve their totalitarian goals. What’s next? Offering rebates to the “good” neighbors and taxing the “bad” guys? Get a WWF donation and get a rebate off your bill? Actually, I spent the whole weekend, including earth hour driving backa nd forth to Fry’s to buy a new TV, and then to replace some missing, and broken cables, and then messed around trying to get some free TV on my rabbit ears. Why would I waste energy paying for cable TV, if I’m not going to be home all day simulating, like real climate scientists do ? I discovered that not all digital TV sets actually have a “Tuner”. Many of the top brands, only have a “scanenr” so they scan the heavens for TV channels and you can onlu have the ones they can see, with the built in scanner. Rmember that the idea behind a TV “Tuner” is to tune in the TV channels, and modern TVs know exactly where eacvh and every TV channel can be found in the frequency spectrum; but usually not exactly in terms of Photon energy from a particular TV station. So if you can’t tune in the station with your “tuner”, how are you going to adjust your rabbit ears to locate the signal. So I bought a new TV that actually does have a tuner. So I’d say I used a darn side morte energy than on a normal weekend, so thans to those earth hour fans, for the extra energy in MegaWatt hours, because I use dup some of it. Hell no, we won’t grow! Hunting/gathering’s the way to go! I pulled all the breakers and went light-free, landline-free (electronic phone), furnace-free (electric thermostat), and refrigeration-free. I put on a jacket (symbolic buffalo robe) in case the temperature dropped in the house (symbolic cave). I brought in my Siberian Huskies (fairly convincing symbolic primitive dogs) by bribing them with chicken jerky (symbolic wild-turkey jerky). I laid down on the carpeted (symbolically hide-strewn) floor with my beasts intending to be fractionally normal by messing with my rooted Nook Color (symbolic painted rock? ), but one of the dogs came over and licked my face for about 10 minutes. Then another started jealously woofing and barking and demanding her own personal attention. When everydoggy settled down, I accidentally drifted off to sleep (non-symbolic after-dark, home-alone activity). I woke up at about 10:00, flipped on the breakers, and let the dogs out. So that’s how I spent Earth Pre-Civilization Hour. In India, many cities have decided to celebrate earth hour every day. No, wait, that is incorrect. In India many cities have been celebrating earth hour for the last 40 years. The power companies of India are doing the world a huge favor by switching off the lights for 1 hour every day. Indian city bred elites have claimed that regular power cuts er.. regular “earth hour” celebrations are essential for stress relief. In villages, earth hour is celebrated every day of the year. It is the most important event in the cultural calendar. People extinguish every light for miles at 7:00 PM in the evening and retire for the night. Millions of mega watts are saved. The ocean gets colder and the polar bears can frolic in the ice for much longer. Hahaha! My bad. I used technical jargon without explaining the term. In the scientific field that I just invented known as Cynolinguistics (where cyno- is a legitimate combining form related to Latin canis and English canine), woo is an informal, shortened version of woowoowoo or (especially among older researchers) woo-woo-woo. Scientific consensus holds that woo was chosen as the representative sound over wah, wuh, and other Husky vocalizations such as barks and growls because it is the most common. Two Siberian Huskies talking…. – 2 min., 2 sec. N.B. that there is not a one-to-one mapping between wooing dogs and Siberian Huskies. Other breeds can exhibit this vocalization, though not as frequently nor as consistently as Huskies. As well, not all Huskies woo. Among those I have lived with, only 37.5% could definitively be classified as wooers. Another 12.5% was believed to have been observed wooing on one occasion. Additionally, 12.5% growl when wooing behavior would be appropriate. (This is the dog that licked my face for 10 minutes, so the growling is not aggressive or defensive.) Another 12.5% enthusiastically barked instead of wooing; 12.5% gave a Siberian Stare on at least one occasion when wooing might have been employed; and a final 12.5% has no similar observations recorded. The dog mentioned in my previous post (“Then another started jealously wooing and barking and demanding her own personal attention.”) can be seen in this photo and in this album. A champion wooer that is no longer with me can be seen in this photo. Earth Hour??? Did that happen already??? I need an app to remind me next time. Oh, wait, I would actually need a cell phone that can use said app, but that would require me to get rid of the cell phone that has served me well and continues to do so and that would add to the mess, oh the dilemma. Oh well, bring on Earth Day, can’t wait to see how much garbage will be created by those who proclaim to care about the Earth. Dubai photo — what a depressing spooky image! For one hour I changed the display timeout on my cell phone from 1 minute to 30 seconds. Unfortunately the substantial power savings of HUNDREDS of microwatt/hours wasn’t reflected on the grid until the next day when I put it on the charger. Curses. I done messed up again. Um, well, yes, that kinda is what energy is good for, isn’t it?